From 1946 to 1949 Katz studied at The Cooper Union in New York, and from 1949 to 1950 he studied at the Skowhegan School of Painting and Sculpture in Skowhegan, Maine. Skowhegan exposed him to painting from life, which would prove pivotal in his development as a painter and remains a staple of his practices today. Katz explains that Skowhegan’s plein air painting gave him “a reason to devote my life to painting.” Every year from early June to mid-September, Katz moves from his SoHo loft to a 19th-century clapboard farmhouse in Lincolnville, Maine. A summer resident of Lincolnville since 1954, he has developed a close relationship with local Colby College. From 1954 to 1960, he made a number of small collages of still lifes, Maine landscapes, and small figures. He met Ada Del Moro, who had studied biology at New York University, at a gallery opening in 1957. In 1960, Katz had his first (and only) son, Vincent Katz. Katz has admitted to destroying a thousand paintings during his first ten years as a painter in order to find his style. Since the 1950s, he worked to create art more freely in the sense that he tried to paint “faster than [he] can think.” His works seem simple, but according to Katz they are more reductive, which is fitting to his personality. "(The) one thing I don’t want to do is things already done. As for particular subject matter, I don’t like narratives, basically." Beginning in the late 1950s, Katz developed a technique of painting on cut panels, first of wood, then aluminum, calling them "cutouts". These works would occupy space like sculptures, but their physicality is compressed into planes, as with paintings. In later works, the cutouts are attached to wide, U-shaped aluminum stands, with a flickering, cinematic presence enhanced by warm spotlights. Most are close-ups, showing either front-and-back views of the same figure’s head or figures who regard each other from opposite edges of the stand. In 1977, Alex Katz was asked to create a work to be produced in billboard format above Creative Time. The work, titled Give Me Tomorrow, reached 28 feet tall and 53 feet long on a billboard space above the Bowery Bar. Located on the corner of the Bowery and East Fourth Street in the East Village, the work was hand painted by sign painters and was installed during the summer of 2005. Katz has collaborated with poets and writers since the 1960s, producing several notable editions such as "Face of the Poet" combining his images with poetry from his circle, such as Ted Berrigan, Ann Lauterbach, Carter Ratcliff, and Gerard Malanga. He has worked with the poet John Ashbery, creating publications entitled "Fragment" in 1966 and "Coma Berenices". in 2005. He has worked with Vincent Katz on "A Tremor in the Morning" and "Swimming Home". Katz also made 25 etchings for the Arion Press edition of Gloria with 28 poems by Bill Berkson. Other collaborators include Robert Creeley, with whom he produced "Edges" and "Legeia: A Libretto". and Kenneth Koch, producing "Interlocking Lives". In 1962, Harper’s Bazaar incorporated numerous wooden cutouts by Katz for a four-page summer fashion spread. Katz's work is in the collections of over 100 public institutions worldwide, including the Museo Nacional Centro de Arte Reina Sofia, Madrid; Metropolitan Museum of Art, Tokyo; the Nationalgalerie, Berlin; and the Museum Brandhorst, Munich. In 2010, Anthony d'Offay donated a group of works by Katz to the National Galleries of Scotland and Tate; they are shown as part of the national touring programme, Artist Rooms. In 2011, Katz donated Rush (1971), a series of 37 painted life-size cutout heads on aluminum, to the Museum of Fine Arts, Boston; the piece is installed, frieze-like, in its own space. Throughout his career, Katz has been the recipient of numerous awards, including The John Simon Guggenheim Memorial Fellowship for Painting in 1972, and in 1987, both Pratt Institute’s Mary Buckley Award for Achievement and The Queens Museum of Art Award for Lifetime Achievement. The Chicago Bar Association honored Katz with the Award for Art in Public Places in 1985. In 1978, Katz received the U.S. Government grant to participate in an educational and cultural exchange with the USSR. Katz was awarded the John Simon Guggenheim Fellowship for Painting in 1972. 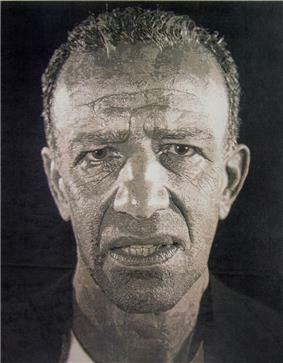 Katz was inducted by the American Academy of Arts and Letters in 1988, and recognized with honorary doctorates by Colby College, Maine (1984) and Colgate University, Hamilton, New York, (2005). In 1990 he was elected into the National Academy of Design as an Associate member, and became a full Academician in 1994. He was named the Philip Morris Distinguished Artist at the American Academy in Berlin in 2001 and received the Cooper Union Annual Artist of the City Award in 2000. In addition to this honor, in 1994 Cooper Union Art School created the Alex Katz Visiting Chair in Painting with an endowment provided by the sale of ten paintings donated by the artist, a position first held by the painter and art critic Merlin James. In 2005, Katz was the honored artist at the Chicago Humanities Festival’s Inaugural Richard Gray Annual Visual Arts Series. In 2007, he was honoured with a Lifetime Achievement Award from the National Academy of Design, New York. Katz' work is said to have influenced many following painters, such as  as well as younger artists like Peter Doig, Julian Opie, Liam Gillick, Elizabeth Peyton, Barb Januszkiewicz, Johan Andersson, and Brian Alfred. Furthermore, it has become ubiquitous in advertising and graphic design. ^ (1983)Lilies Against Yellow HouseAlex Katz, National Galleries of Scotland.